I've been thinking recently about how you can make your Scratch games more professional and complete, and two ideas occurred to me: including a title screen and a high score table. I wrote tutorials on how to do both for The MagPi magazine, the official magazine of the Raspberry Pi. A lot of people who are interested in Scratch aren't online much over the summer (teachers and their students) so I thought I'd wait until the new school term before telling you about them both here. You can download the back issues that include these tutorials for free. 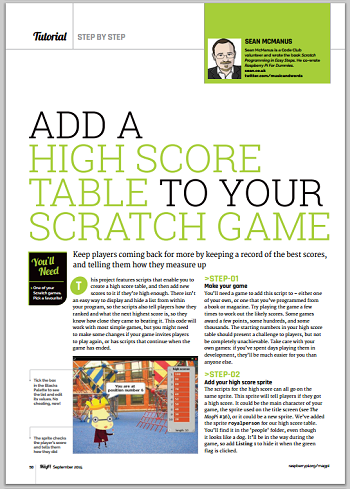 Issue 37 includes my tutorial on adding a high score table to a Scratch game. It uses a list to store the top ten scores and then compares the new score and tells you how you ranked. It should work with most simple games. Issue 36 included my tutorial on adding a start screen to your Scratch game. I included a simple game for this so that the article could demonstrate the transition between the game and its title screen. The same concept should apply to most simple games. The article includes tips on patching the title screen in, in place of your 'when green flag clicked' scripts. The MagPi is published each month, and you can support it by buying it in WH Smiths as a printed magazine or subscribing to receive it by post. If you'd like to explore Scratch further, check out the supporting resources for my book Scratch Programming in Easy Steps, including my 10-block Scratch demos.